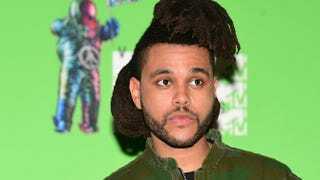 Abel Tesfaye, the Canadian singer who goes by the name the Weeknd, obviously has no problem with being treated like a black Chia Pet. The “Can’t Feel My Face” singer recently spoke about an encounter with Taylor Swift that caught him off guard. In an interview with Rolling Stone, Tesfaye recounted how, during the incident, Swift just couldn’t stop petting his hair. For the life of me, there are a few things I don’t understand about the Weeknd. Those include the spelling of his name, why he’s trying to reinvent Jean-Michel Basquiat’s hair, the fact that he thinks he sounds like Michael Jackson and why he thinks it’s an honor to be petted by Swift—which proves they’re both basic. Someone should probably teach Swift about some boundaries and Tesfaye about when boundaries are being broken.